The rom is the problem not the unlocked bootloader. 8.4.28 passes safetynet and is google certified but not the 8.4.12. Dont ask me why, have the same problem with other app on 8.4.12. But dont flash 8.4.28, you wont be happy with this very!! laggy version. There is always a global rom (_V9.5.4.0.ODGMIFA) but its a little bit tricky to install and this dont pass safetynet and google too. There is a new version on sourceforge: 8.5.4. This version passes Safetynet and Google verification again and is much more smoother then 8.4.28. On ROM 8.5.17 Google pay does not work. Certification is verified, but it is not possible to add a payment card. How to solve the problem? did you install any root or xposed? No. Clean ROM. This problem is already big. Ask for help. which device? check safetynet if it pass..
Mi mix 2s device (M1803D5XE). It was with the Chinese Rom. Now upgrade on your 8.5.17. Safetynet it passes. There are already many people with this problem. Help!!!!! 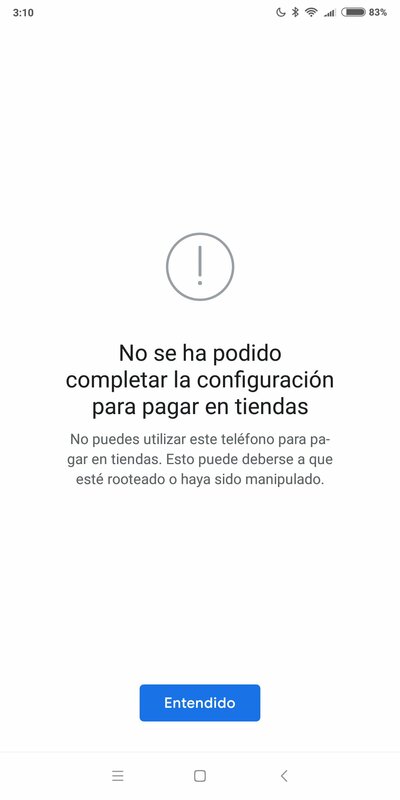 when installed on Chinese ROM gapps and then Google pay, Google Pay doesn't work either. If the EU is built on Chinese ROM, maybe that's the reason? lol.. sure.. Android pay works fine on our ROM.. doesn't on chinese ROM. I screen on the evening'll post an with EU and G pay. It doesn't. I appeal to the developers. Is it possible to solve this global problem? seems ok for other users.. so its your issue.. clean install our rom and try.. The problem exists only for users of the M1803D5XE model. But if the EU is based on the Chinese ROM, the problem will be global. Does it work on Global stable with locked BL..? You cannot install Global Stable on M1803D5XE and then lock the bootloader. Global Stable will only work on an unlocked bootloader.